Government has no immediate plans to phase out kombis, an official has said. In an interview with The Herald, Deputy Minister of Transport and Infrastructural Development Fortune Chasi said the reintroduction of ZUPCO buses was meant to increase convenience to the commuting public. 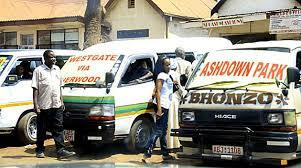 The management of the buses plying local routes in urban areas has since been transferred to the Ministry of Local Government, Public Works and National Housing. Deputy Minister Chasi said the move was in accordance with the initial allocation of roles which places the management of urban transportation under Minister July Moyo’s portfolio. “What we did as the Ministry of Transport and Infrastructural Development was to sort of take a leading role in the re-introduction of ZUPCO into the urban mass transport system, but now that the systems are in place, it is right that the ministry mandated to run them takes over,” he said. Deputy Minister Chasi made the remarks while touring Warren Park with transport operator Pamushana Africa, as the transporter officially launched its tap and go card technology. The technology allows passengers to load their cash into a smart card which they use when boarding. During the tour, Deputy Minister Chasi spoke to passengers, drivers and conductors in a bid to understand the problems they face in their commuting lives.